Writing about food is such a pleasurable experience. While recalling the flavors and reviewing photos from a particular meal, one has chance to re-live the experience. And recently, we had a meal worth remembering at Gion Matayoshi, a tiny ryotei (traditional dining establishment) that was upgraded from one- to two-Michelin stars in 2012. It is the current featured article on Savory Japan. In the article I talk about mitate, a term used in the world of tea: That rarified, yet omnipresent way of thinking, seeing and living that makes Japan, well, Japanese. I didn’t have the space to explain it fully there, so I will attempt to do so here. Mitate means to “see with new eyes.” To arrange something in a new way so that it represents another idea, form, or time — so as to bring beauty and poetry, as well as a feeling of gratitude — for both. Take, for example, Matayoshi’s opening course, pictured here. What do you see? What at first glance appears to be an egg yolk is actually a soft sphere of delicate and creamy corn kuzu, topped by two elegant slivers of sudachi rind, immediately bringing to mind the yellow-orange glow of the full moon, adorned with another version of itself, a crescent moon. Even before Matayoshi set the bowl before us and said, simply “tomorokoshi no tsukimi dango” (corn moon dumpling), we appreciated the poetry, contemplating for a moment the beauty of the moon reflected in a bowl, set gently in a pool of inky sauce, like the night sky. For those who know what tsukimi dango look and taste like, how radically different was Matayoshi’s version, so much more fitting for the season than a rice cake with red bean paste? But why do I call it modern mitate? Because one could argue that true mitate is always modern because it is new. However, there are plenty of examples in Japanese culture where the mitate itself becomes old. At any rate, I call it modern because it opened our eyes. Not only were the ingredients unexpected — with corn coming from the new world and not traditionally used in Japanese cuisine — but here we could see two phases of the moon at once; a time-shift that we barely noticed at first. And the taste? 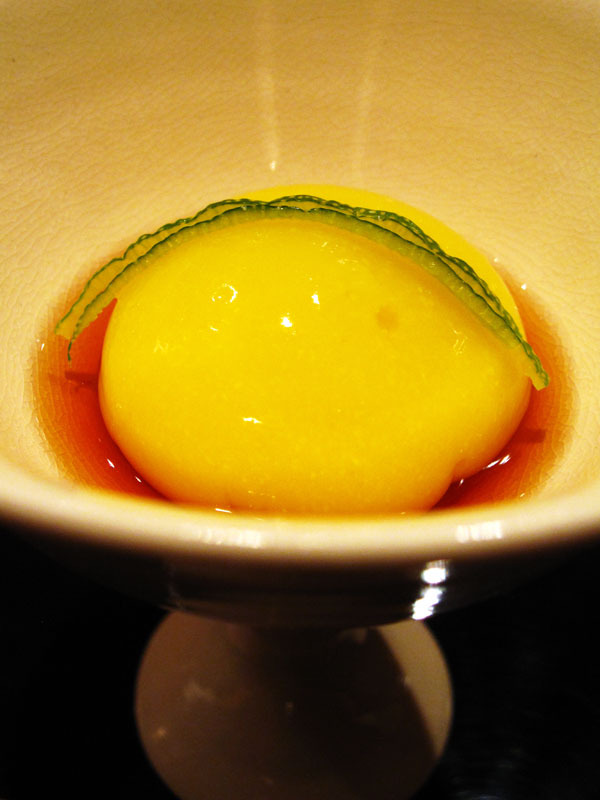 Sweet and gentle, like only corn can be, the texture so silky and soft as to barely hold together; the tosa-su (a kind of vinegar) sauce and sudachi lending just the right tart acidity to complement the sweetness. So fitting for the season of the harvest moon of early autumn, when the nights are still warm. Just think. Four paragraphs just for one dish. Yet, I don’t know if I could properly convey the concept of mitate. The meal revealed more examples of modern mitate, so be sure to read the entire article and view the photos here. Akemashite omedeto gozaimasu. Happy New Year! Yesterday, we celebrated Oshogatsu (the new year) — Japan’s most important holiday — with family and friends. Every year we spend at least three days shopping, prepping and cooking for this occasion, and each year it really tires us out. Our legs ache from standing for days on end, while our arms are sore from chopping and heavy lifting. In fact, every year we even talk about how we’d like to simplify — or even quit — the tradition, until the end of the year arrives and we find ourselves once again excited, planning ever more elaborate parties. So forgive us for the late posting. We would have posted these photos yesterday, but we were on our feet, non-stop from 6:30am until 12:30pm with barely 10 minutes to sit down. Like all important cultural events, food is central to the celebration. Pictured above is one of the tiers of jubako (lacquered strays) chock-full of osechi ryori, the typical food enjoyed during Oshogatsu. Placed around the boiled sweet shrimp and salmon rolled in daikon (giant radish) are, clockwise from upper left: Kamaboko (fish cakes) in red and white, Japan’s auspicious colors (pink and orange are considered red); ikura (salmon eggs); datemaki (rolled fish and egg cake) the color of sunshine and gold; kombu maki (rolled kelp, simmered in sweet sauce) and tazukuri (dried sardines). Placed on top are several slices of renkon (lotus root) cut into flower shapes. We have a four-tier jubako from the Meiji era, and every box is filled with a sumptuous arrangement full of foods with symbolic meaning, all meant to bring good fortune to our loved ones. 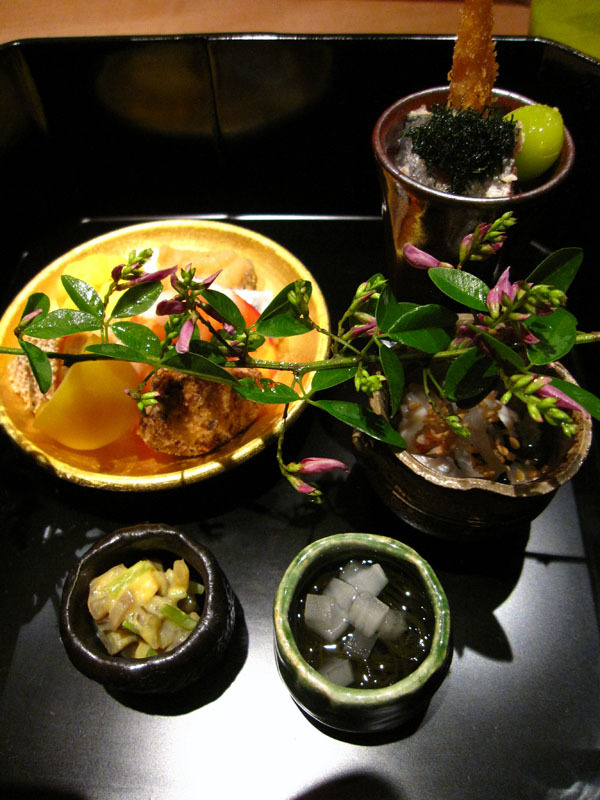 Pictured at left, the lower box holds simmered buri (winter hamachi, or yellowtail), sato imo (mountain potatoes), renkon (the lotus is a Buddhist symbol) and shiitake mushrooms, topped with Kyoto carrots (naturally deep red) cut into the shape of ume (plum) blossoms, which we look forward to seeing in spring. Flanking the boxes on the left and right are symbols of fertility: A bowl of crunchy kazunoko (herring roe) to bestow many children, and tazukuri (literally, “to make rice fields”). The name hails from a time small fish were used as fertilizer. 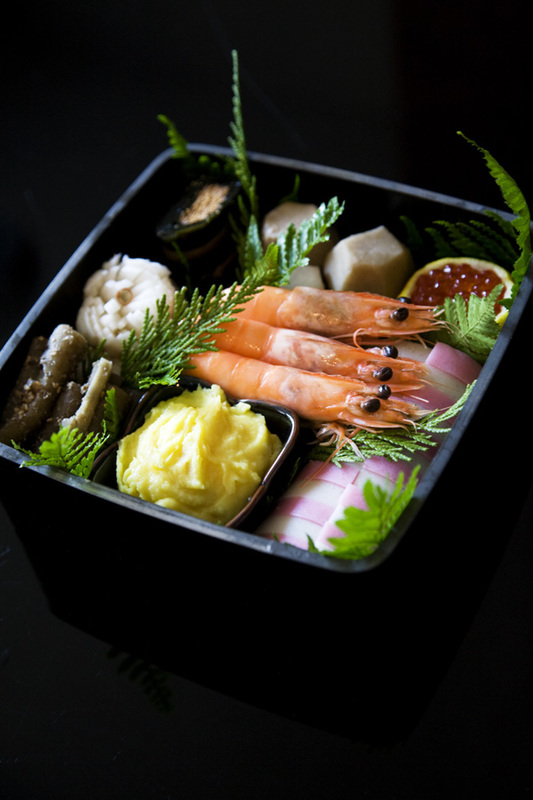 Osechi is a centuries-old tradition, and it’s interesting to see how such names and traditions survive. 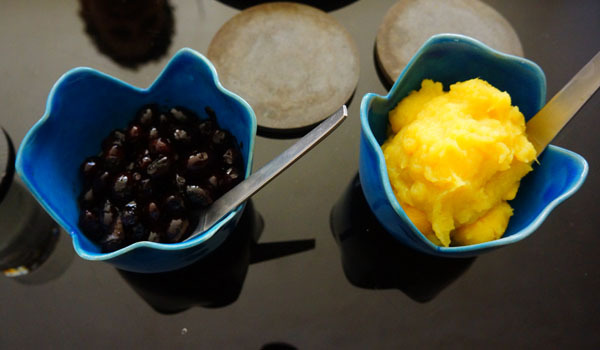 Fertility is represented again above, left; in the form of kuromame (simmered black beans), while kurikinton (sweet simmered chestnuts and sweet potato), the color of gold, bring good tidings of wealth. More information about Osechi ryori, including recipes for many of these dishes pictured here — can be found on the Oshogatsu page on Savory Japan. There, we also share our family history surrounding the festival, and the reasons we choose to go to such lengths each year. We’ll share more food photos on the Savory Japan facebook page, and flower designs on the facebook Mizuya page. May the good fortune described here come true for you, and may 2013 be a great one for you and your family! 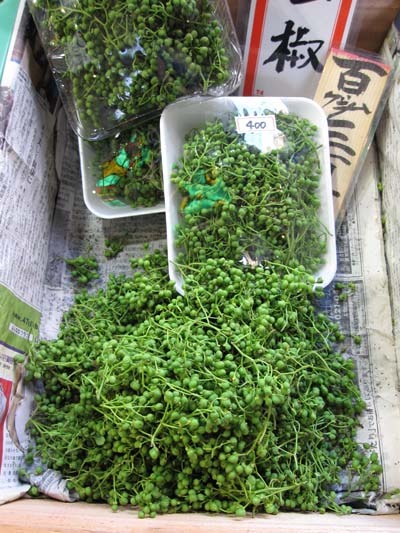 If you’ve ever traveled to Japan during the month of May, you probably had a chance to try fresh sansho no mi, the delightfully spicy pods of the sansho pepper plant. At least, we hope so! For the uninitiated, it’s hard to describe this intensely spicy taste sensation, but we soon became hooked, buying fresh sansho no mi to take home. I’ve kept a bag in the freezer, using a tablespoon every once in a while to make tsukudani, simmering it with kombu (kelp) in dashi, sake, sugar and soy sauce. The result is so delicious that my husband calls to thank me whenever I put some in his bento. Learn more about this wonderful spice — which is actually only one part of the versatile sansho bush that can be eaten — in our “in season” feature for May. Everyone is talking about the recent movie “Jiro Dreams of Sushi.” Have you seen it? I found the movie fascinating, and like everyone else, I dream of being lucky enough to dine there one day. However, reservations are made a year in advance, and according the the movie, it costs ¥30,000 for dinner OR lunch. And as much as I’d like to try what critics call the most delicious sushi in Tokyo, I think I’d feel a bit intimidated by Jiro’s stern presence. We had a chance to dine at Sushi Kanesaka, another Michelin-starred sushi establishment (with two stars) that is much more accessible and highly recommended. Let’s face it; dining at an elite sushi establishment can be an intimidating experience for visitors, but the welcoming chefs and elegant, comfortable room put you at ease. There, we enjoyed a fantastic lunch course for far less, and enjoyed classic Edomae (Tokyo-style) sushi in a relaxed atmosphere. 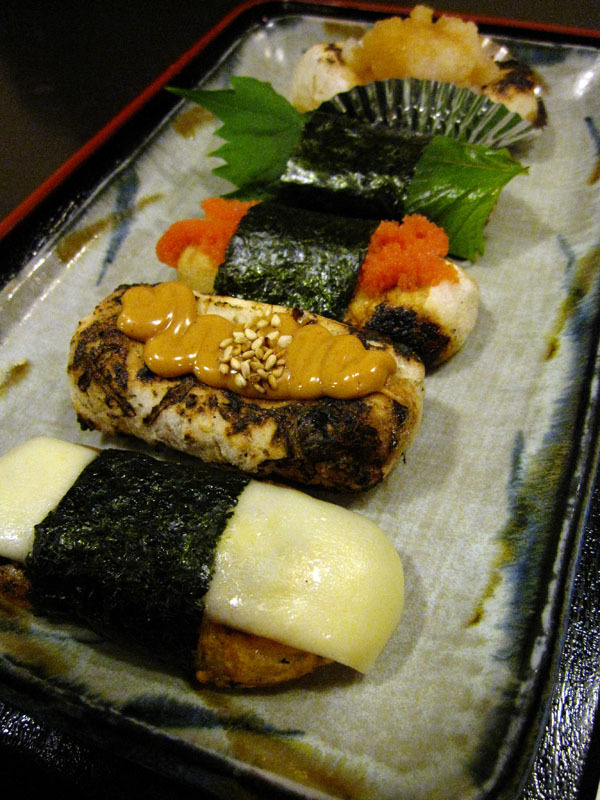 Read the article to learn more about what fans call “Kanesaka style” sushi. This month, we’re launching a new section on Savory Japan called In Season: The Calendar of Shun. Here is where we’ll feature the very best foods of the season, month by month. If you don’t know about the Japanese concept of shun, read about it here. 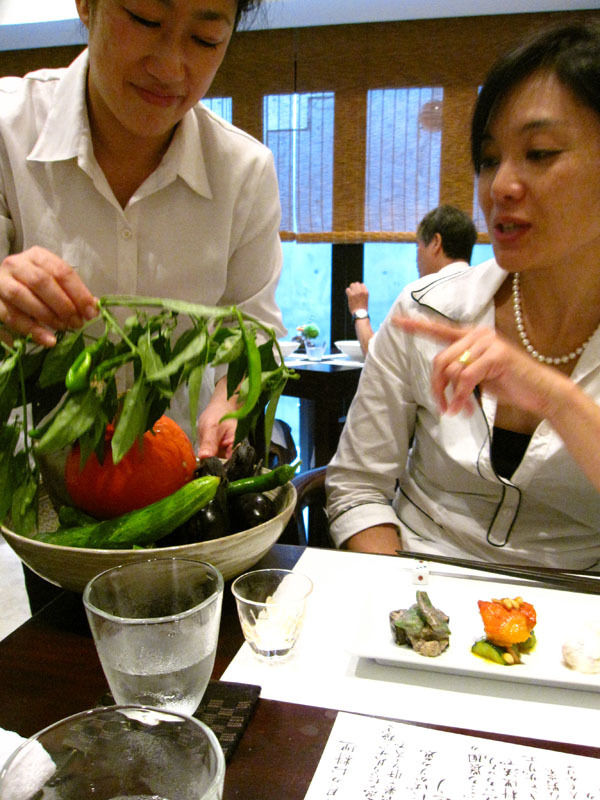 Starting off the series is a profile of April’s early spring bounty, which includes sansai, or mountain vegetables. I have fond memories of gathering bracken fern shoots with my parents, who love food more than anything else (especially if it’s free.) They used to gather big bags of the tender shoots during vacations in the North woods. Although I no longer relish the thought of all the poor ferns that lost their lives, I do love their unique texture and flavor, especially on top of soba. Learn more about sansai, and look for more profiles of shun in the coming months. Featured on Savory Japan for April is Esaki, a wonderful three-star Michelin rated establishment featuring chef Shintaro Esaki’s innovative cuisine. Every single bite of our lunch was surprising and incredibly delicious. And midway through our meal, our server came to the table bearing the bounty of the season in a basket brimming with the wholesome, fresh produce that went into our meal. Esaki is a place we’d like to return to again at different times of the year, as seasonal shifts bring varieties of seafood and produce into their shun (the peak of flavor). Today is Hinamatsuri, Japanese Girls’ Day. This month on Savory Japan, we introduce the festival, as well as some of the special foods that are enjoyed on this day. The beautiful Odaira-sama (Emperor) and Ohina-sama (Empress) dolls pictured here are our family treasures — given to me by my mother and aunt (my grandmother, sadly, passed away before I was born). They will be handed down to my sister and her eldest daughter (as I have no children), and so on. In modern Japan, the Emperor is usually seated on the left hand side. We’ve always displayed them in this manner — with the Empress on the left hand side — which is apparently the old, or traditional style. 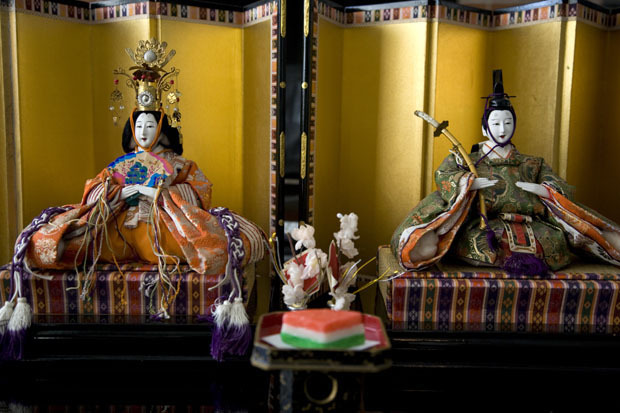 Read more about the Hinamatsuri Festival. 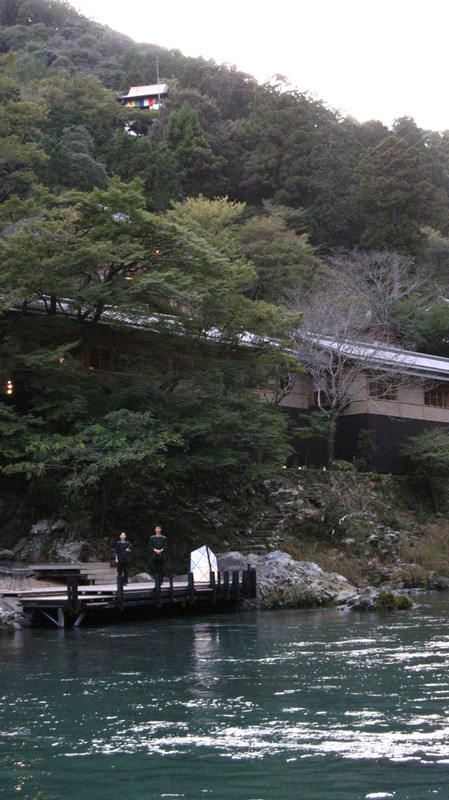 Last Autumn, just after we stayed at Hoshinoya Karuizawa and made a brief detour to Nagano, we arrived at the boat launch for Hoshinoya Kyoto, the latest addition to the luxury modern ryokan (Japanese inn) resort as envisioned by Yoshiharu Hoshino. Stepping onto a specially designed wooden boat, we traveled for just a short distance in a matter of a few minutes, yet the separation from the outside world immediately began. Then, the elegant roof lines of the complex of 16th-century buildings came into view and we noticed two Hoshino staff members standing ready at the boat landing. We knew we were about to experience something unique. We can’t say enough about this resort — it’s otherworldy. But what surprised us the most was that in the midst of all the pampering in luxurious surroundings, there were also ample opportunities to learn. And this made all the difference — leading to something much deeper. Read more. Happy New Year! May 2012 be filled many delicious meals shared with good friends and family. 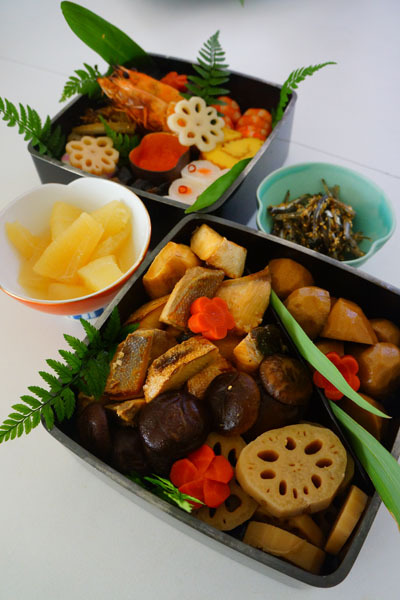 We thought we’d share some tips we’ve learned over several years of putting together the oshogatsu (New Year’s) meals in jubako (tiered lacquered boxes). It was only a few years ago that we finally purchased a high-quality, four-tier antique black lacquered jubako, and we’re starting to really enjoy the art of filling them with osechi ryori (New Year’s cuisine). Above, we have a detail of one of the more colorful boxes, filled mostly with things we didn’t make, but purchased. In the center is a gold kozara (small dish) filled with ikura (salmon caviar). Nestled closely around it (clockwise, from top left) are; two dishes made with eggs: Datemaki flavored with yuzu (citron) and Nishiki tamago (egg separated into yellow and white and pushed through a fine sieve); Several kinds of kombumaki (kombu rolled around a center and simmered until tender) filled with salmon, anago (sea eel) and tarako (salted cod roe). We were able to keep the bright color and round shape of the shrimp by first skewering them into shape, quickly parboiling to set the color and then gently boiling them in dashi mixed with sake, shoyu and mirin. 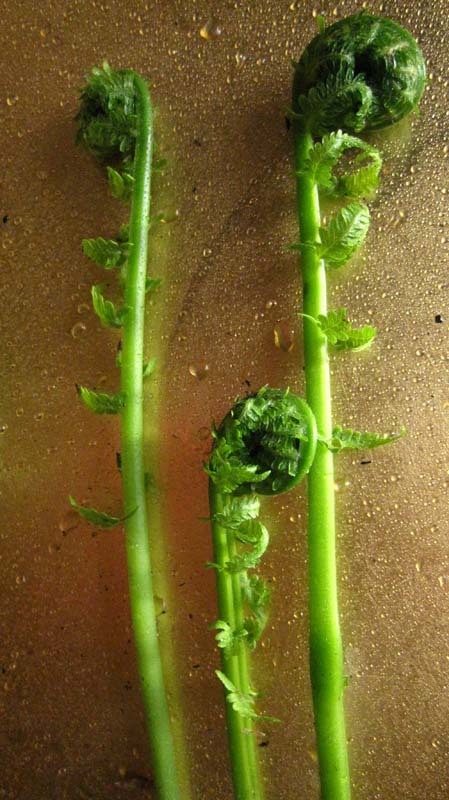 Ferns and cedar branches — as well as parboiled snow peas — serve to set off “zones” for each type of food. It’s always nice to have a few large focal points as well. The gorgeous prawns in the center of the box pictured above serve this function well. It’s important to keep to the lucky numbers such as one, three and five. Therefore, even though the prawns were sold in packs of two, we placed three here and one in another box. Around the prawns are kombumaki, simmered sato-imo (taro); yuzu filled with ikura, pink and white kamaboko (fish cakes); creamy, golden kurikinton; tataki gobo (pounded burdock) and kiku kabu (turnip chrysanthemums). Take care to place contrasting colors next to each other, and pack them tightly so as to portray abundance. 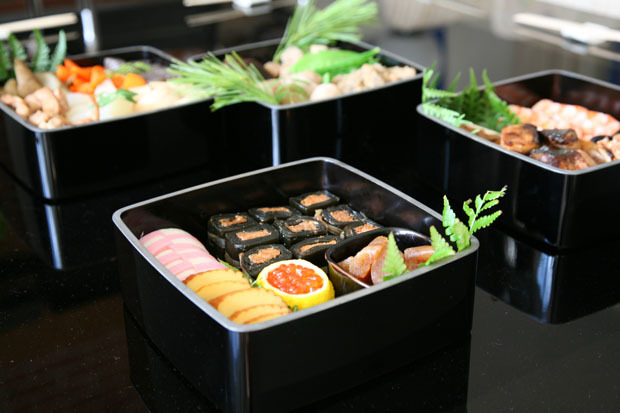 Osechi ryori is designed to be eaten at room temperature, so it’s a wonderful way to throw a party. If kept simple, you only need to replenish the boxes as the night progresses. And while I always aim to include ALL the dishes for the party in these lovely boxes, we invariably find that some things — such as salads — are better served in bowls. I suppose we just need to find some small black lacquered boxes to hold such items. Oh well, that will be for next year. The anticipation of the year’s jubako is always a joy. We talk about what and what not to include during the year. But we always include the classics. For recipes and an explanation of the history and symbolism of nine of these important dishes, please refer to the Oshogatsu page on Savory Japan. New Year’s is just around the corner, and we’ve already completed half of our shopping for the coming year’s Oshogatsu celebration. 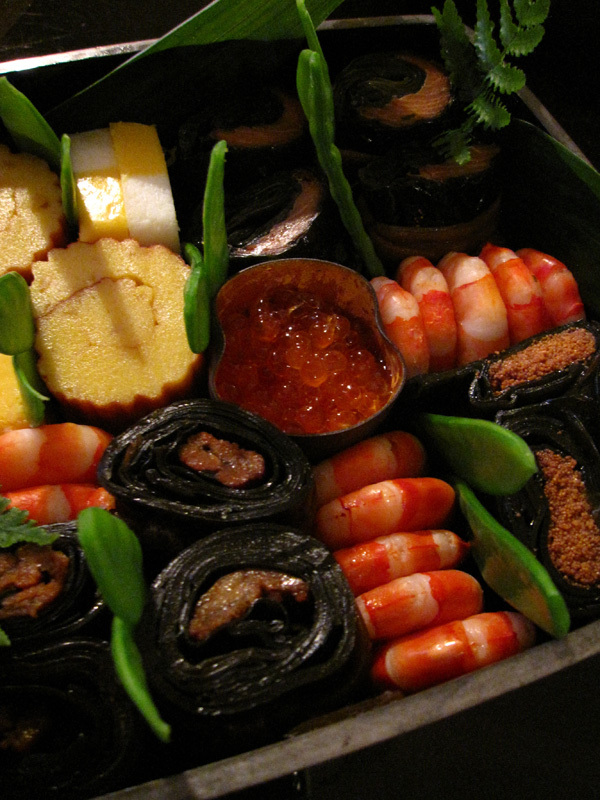 The centerpiece of the meal is osechi ryori, pictured above, served in antique black-lacquered trays. 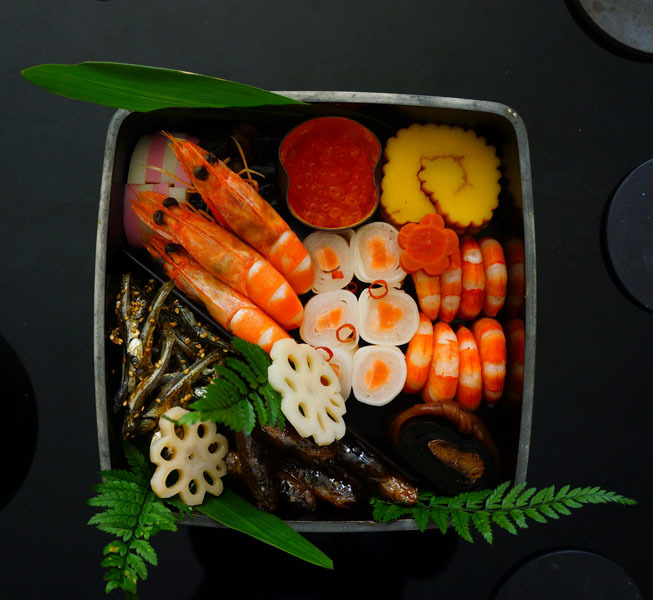 Osechi is a time-worn, ancient type of cuisine that is heavy on long-simmered vegetables and sweet, sour and savory flavors. As you might have seen in past blog posts about oshogatsu shopping, preparation and cooking, and the long-awaited celebration, the whole process is a lot of work. So much work, in fact, that last year’s Oshogatsu party — one of the biggest and most elaborate we’ve ever thrown — tired us out for three days. 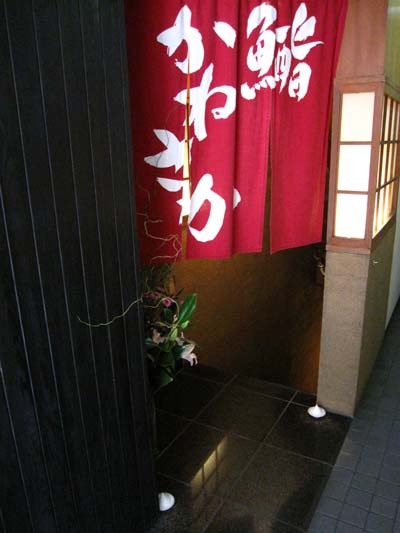 This year, we’re planning to spend a quiet Oshogatsu and will host a smaller party. Part of the menu will include some kind of grilled mochi topped with various colorful and flavorful toppings, as served at Mochikiya, a charming mochi shop at Kyoto’s Nishiki Market. My husband plans to include a new recipe for mochi topped with Kobe beef and black sesame sauce. We always like to mix a few rich, Western dishes with the light and healthy Japanese ones — in small portions, of course. We’d like to take this opportunity to wish you a very Happy New Year. May 2012 bring you and your family joy, health and prosperity.